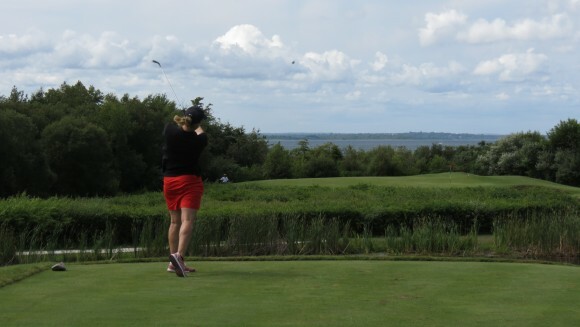 The 17th Annual Amos House Charity Golf Tournament will be held Monday, June 8, 2015 at the exclusive Sakonnet Golf Club in Little Compton, Rhode Island. Sakonnet Golf Club is a private club featuring an 18-hole regulation golf course with stunning views of the Atlantic Ocean. Club amenities include tennis courts, a pro shop, driving range, and clubhouse. The Tournament, which attracts business leaders from across New England, includes a spectacular day of golf, barbecue luncheon prepared by Amos House&apos;s own More Than a Meal catering, a spirited raffle, silent and live auctions, contests, prizes and post-golf cocktails and a banquet. Amos House provides support for men, women and children in Rhode Island who are hungry, homeless and in crisis through food, shelter and social service programs. Amos House provides the tools people need to attain greater sufficiency and self-reliance in their lives. The organization operates the largest soup kitchen in the state, serving approximately 800 meals daily. Amos House provides a continuum of housing for homeless men, women and children from a 90-day Transitional Program to permanent supportive housing with a total of 175 beds. All of the housing is sober housing and more than 90% of the residents are ex-offenders working to reintegrate into the community. More than 15,000 individuals visit Social Services each year for assistance with housing, emergency financial assistance, IDs and birth certificates, transportation, hygiene packets, and referrals for substance abuse treatment and employment. Although originally founded to serve homeless individuals, over the years Amos House has become a lifeline for many poor men, women and children struggling to stay afloat. This tournament raises more than $130,000 to help fund the many programs and services that Amos House provides to those most in need. Annie Colella began her marketing career in the tourism and hospitality industry working for Discover Newport. In 2013, after 7 years at Discover Newport she left her role as marketing project manager and joined Amos House in Providence to coordinate their marketing and special events. In her free time she enjoys skiing, mountain biking, traveling and hiking.